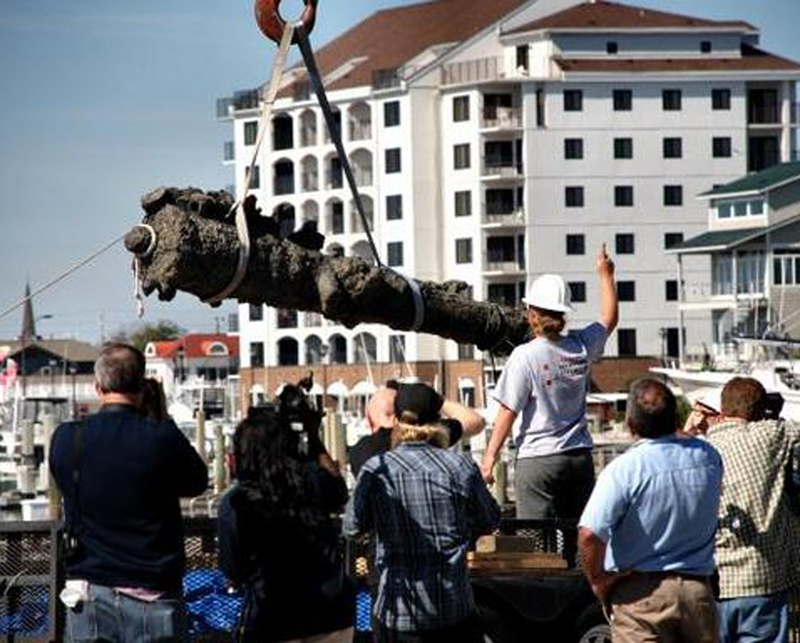 BEAUFORT, N.C. - A 2,000-pound cannon pulled from the waters near Beaufort Wednesday will give archeologists and historians more ammunition for separating fact from legend surrounding the infamous pirate Blackbeard. The Queen Anne's Revenge Project brought the massive gun ashore and displayed it to the public before taking to a laboratory at East Carolina University. Onlookers cheered as the 8-foot-long gun was raised above the water's surface. "The last people who saw this were pirates," QAR project director Mark Wilde-Ramsing told more than 100 spectators who later gathered in front of Beaufort's Maritime Museum for a closer look at the 18th century weapon. Dozens of local residents turned out, while some Blackbeard enthusiasts drove in from other parts of the state. "We read about it last night, and I asked the kids: are we going to skip school tomorrow and go see this?" said Joy Herndon, who made the roughly 230-mile trek from Greensboro with her children, Lucy and Kevin. Is wreck Blackbeard's last prize? Separating the Blackbeard legend from historical facts is one of the goals of the QAR recovery effort, which has so far netted some 280,000 artifacts, said Joseph Schwarzer, director of the North Carolina Maritime Museum. "This is about as close to that particular point in American history, and to piracy, as anybody is ever going to get," Schwarzer said. The recovery effort involves collaboration between the state departments of Cultural Resources and Environmental and Natural Resources, the National Oceanic and Atmospheric Agency, East Carolina University and other agencies. The gun recovered Wednesday was the 13th cannon raised from the shipwreck. Other items have included medical supplies, dishes, gold dust, prisoner shackles, African jewelry and small weaponry. Schwarzer said researchers believe the ship was built as La Concorde, a French slave-trading vessel, but was commandeered by Blackbeard and his crew six months prior to its grounding near Beaufort Inlet. Historians theorize that the ship was intentionally scuttled by Blackbeard, who then took off in a smaller boat, because he could no longer afford the expense of four ships and a pirate following estimated at 400. Neal Stetson, 58, said he and his wife drove a half-hour from Newport to see the recovered cannon. "After we moved here, I became fascinated with Blackbeard, particularly all the tales and legends that surround him," said Stetson, who came to the area from Maryland six years ago. "It's amazing and fortunate that they found the wreck." An exhibit of the items recovered from the ship opened at the Beaufort Maritime Museum in June and has already attracted more than 100,000 visitors, said N.C. Cultural Resources Secretary Linda Carlisle. Only about half the shipwreck has been examined so far, but Carlisle said the state has a goal of finishing the recovery effort by 2013. "We're really concerned about the site itself," she said. "We live through each hurricane season with trepidation." The project could move more swiftly if additional funding was available. Carlisle said it costs about $150,000 annually for the recovery and lab work, but state funding has not kept up with the need. Though some flakes of gold dust are the closest to pirate's treasure yet discovered, the project and museum exhibit has netted the state a valuable influx of tourism dollars, as well as drawn international attention to the state, Carlisle added. The cannon will be preserved at the lab at ECU while the research staff studies both the weapon and the cement-like shell of sand, salt and barnacles covering it, a process that could easily take five years, said Sarah Watkins-Keeney, chief conservator for the QAR project. Blackbeard was an Englishman whose real name may have been Edward Teach or Thatch. After capturing La Concorde in the Caribbean, Blackbeard and his men blockaded the port of Charleston for a time. He was sailing north from Charleston when his ship went aground in what was then known as Old Topsail Inlet, now Beaufort Inlet. After being granted a pardon from North Carolina Gov. Charles Eden in June 1718, Blackbeard was killed five months later by members of the Royal Navy of Virginia at Ocracoke Inlet.